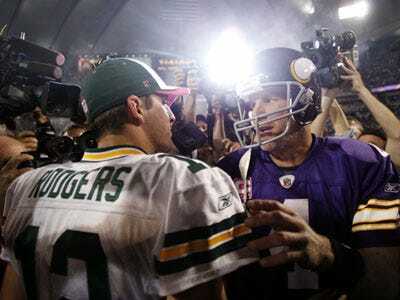 SUPER BOWL SUBPLOT #4: Did Someone Say "Favre"? In 2008, Brett Favre retired to make way for Green Bay’s quarterback of the future. A few months later, he decided he wanted to un-retire and asked for his old job back. The Packers were forced to choose between continuing uncertainty with their increasingly ineffective superstar, or the young gun they considered to be the future of their team. Favre went to the Jets, then the Vikings, a sexual harassment lawsuit, injuries, interceptions, fines and a lot of disappointed and angry fans. The Packers are favoured to win the Super Bowl today. We think they made the right choice. But even though Favre is gone, he is not forgotten. Sports books are taking bets on how often his name might get mentioned tonight. The truth is he should be mentioned, because the decision to spurn Favre — the franchise’s most beloved player ever, back at a time when everyone still admired him — was not an easy one to make. But it was the decision that led the Packers to where they are now. Rodgers is the better quarterback now. The Vikings (who chose Favre over their own young QB) are in shambles. The Packers management made the toughest call that a boss can make and it paid off.